Chocolate is a complex ingredient. It's flavour profile ranges from bitter to sweet. Its flavour is influenced by its origin, from Madagascar to Peru, France to Switzerland; single origin and blended chocolate flavours reflect the type of cocoa bean used and the creative hand of the chocolatier. February is the time of year where our minds turn to chocolate, for Valentine's day recipes or for warm and cosy recipes to warm up us at the height of winter. The Canadian Food Creatives have come together again to showcase delicious sweet and savoury chocolate recipes for you to try on Valentine's Day. 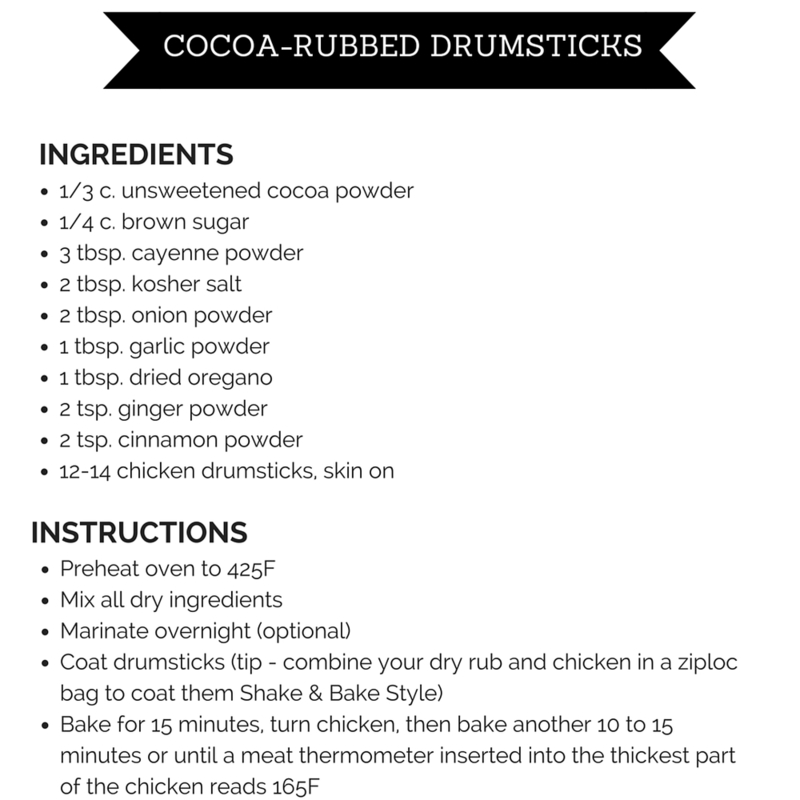 These Cocoa-Rubbed Drumsticks are so easy to make, but the mix of cocoa, pepper, ginger and other warm spices make for a sensuous Valentine's treat or a perfect week night meal. Ready for more chocolate goodness? Try all of the Canadian Food Creatives' 'mood food' chocolate based recipes! Happy Valentines Day!